When I first heard of this artbook, it was on Kickstarter. The publisher is 3DTotal Publishing and I'm quite surprised they released an artist-specific artbook which they don't usually do. Anyway, the Kickstarter campaign that ended in November 2013 was successful and now we have this book. It's great that this book is also available to those outside of Kickstarter, and the price of this book is even less than on Kickstarter, except there's no signed certificate and your name printed in the book. This is a large format squarish size 152-page hardcover that comes with a thin cardboard slipcase. 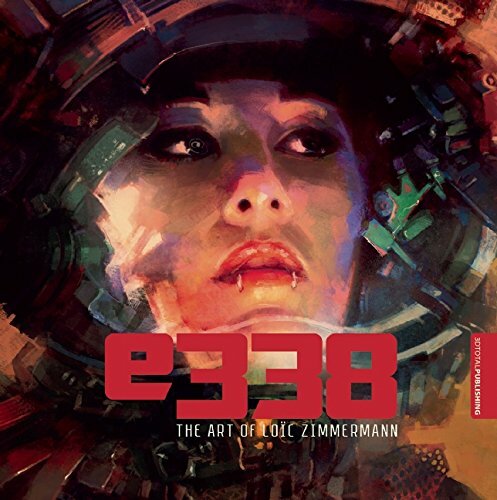 e338: The Art of Loic Zimmermann features the collection of artworks from French visual artist Loic Zimmermann, aka e338. He dabbles in fine art, photography, 3D, concept art and illustrations, and has worked on films such as Thor: The Dark World and X-Men: First Class. Man of many talents indeed. Zimmermann likes to experiment and tries his hands at different and many art processes. The selected works you see in the book are created from different media, 3D, paintings, collages, photography and even silkscreen. Many look like his personal works, and many are portraiture based, and a handful on urban settings, buildings and cars. It's beautifully designed book, the art and printing are great. It seems that he prefers a low key lighting and colour scheme for his artworks. You'll be able to get a sample of his artworks on his website also as some of which are in this book. In addition to the art, Loic Zimmermann also dishes out some career advice and guidance in the book. Occasionally he talks about his evolving art process, and sometimes on how to handle a career as an illustrator. There's also an interview in a sense, an exchange of thoughts between German artist Michael Kutsche and Zimmermann included, appearing at different sections of the book. As a bonus, there's a 1 hour video provided on 3DTotal Publishing's website where Zimmermann walks you through his processing using one of his paintings. Overall, it's a great artbook for fans of Loic Zimmermann.